Vedas are a very ancient body of literature that originated in the Indian subcontinent around 1500-1000 B.C as estimated by Indologist scholars although traditional Indian Calendar (Yugabda) puts it about 4000 B.C. Vedic literature consists of hymns praising gods personifying natural and cosmic phenomena like rain, fire etc. or abstract qualities like speech, thought etc., sacrificial and ceremonial rituals for pleasing such gods for attainment of worldly/heavenly pleasures. Towards their end, emerges a highly evolved section of philosophical thought and spiritual inquiry into the nature of soul, birth and death etc. There are no known authors of Vedas; they are deemed to be revelations of great seers called rishis. They are classified into four by sage Vyasa: Rig, Yajur, Sama and Atharva. Thus Vedas be classified into two sections: hymnal, ceremonial and sacrificial-rites portion (Karma-kanda) and the wisdom portion (Jnana-kanda). This latter wisdom portion of the Vedas are called the Upanishads which deal with the ultimate spiritual vision whose attainment is portrayed as the goal of human life. For this reason, Upanishads are also known as the Vedanta, that is, the end or final goal of wisdom (Veda, wisdom; anta, end). Upanishads deal only with the ever-lasting fundamental principles governing the nature of Truth, therefore, they are applicable at all times and climes. 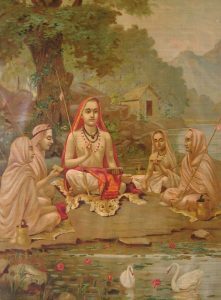 Upanishads are, therefore, called Shrutis (“that which are heard”) while all the other scriptures are called Smritis (“that which are remembered”). These Smritis, by their very nature, need to evolve with time and place to be relevant for current lifestyle and thought. Another unique feature of Upanishads is their exhortation to have earnestness in quest for Truth with complete fearlessness. As they present the philosophical thought mostly through a dialogue between the teacher and student, no query by a student is seen to be “blasphemous” or “inappropriate”: the Upanishads implores each one of us to be fearless in our inquiry into the nature of this world and our individuality guided by a sharp and strong intellect that discerns to accept the “real” (permanent) and eschew the “unreal” (impermanent). The Upanishads uphold only the actual experience and perception of this “real” nature as the goal discrediting a mere intellectual knowledge about it or even the scriptural rote-learning. Bhagavad Gita, the teachings imparted to Arjuna by Sri Krishna in the battlefield of Kurukshetra in Mahabharata, is the epitome of all philosophical thought contained in the Upanishads.